I know on Friday I said my freebie was coming, but it isn't the one I had been working on. Although I'm a teacher to 32 wonderful little K-kids, I'm also a mom to an 18 year old college freshman and a 15 year old high school sophmore. I've spent my weekend being a mom. 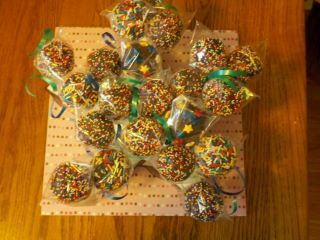 So far this weekend I've made cake pops for the cake auction for my son's Robotics Team, Helped with the teams pasta feed and silent auction- had to make a basket for that too. Yesterday I sat in the pouring down rain to watch him play soccer. Last night I helped my daughter with her speech for speech class, babysat my 7 year old niece, then cleaned up the mess my niece made. She spilt cake sprinkles all over my kitchen. Today I'm tackling the 7+ loads of laundry. Somewhere in there I still need to meal plan for the week, check my son's homework and catch up on last weeks DVR'd television shows. So until I can get back here to my desk, in between laundry and such, here is something to tide you over. I may have posted this last year, can't remember. 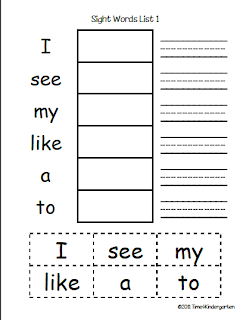 I made several of these last year for my Kinders- they loved them. Just another way to practice working with their sight words. Sometimes it is hard being a devoted teacher and an amazing mother! It sounds like you are doing wonderfully! I think I sometimes teeter on the edge of both. And well me and laundry... we are NOT BFF's!